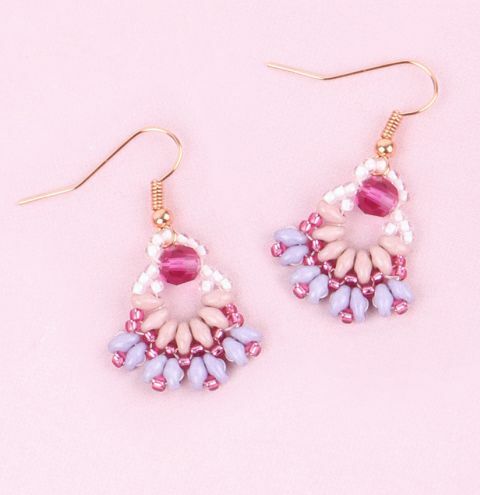 Make a cute pair of pink beaded earrings with a Swarovski faceted bead in the centre! Cut a length of thread and add a needle to one end. Thread on 3 x white seed beads, one of your ear wires, and 3 x white seed beads. Thread through a large pink Swarovski faceted round bead and thread around this circle of beads again. Knot the thread and the tail thread together. Thread out of the crystal and pick up 2 x white seed beads, 7 x twin hole beads and 2 x white seed beads. Thread through the crystal and knot to the tail thread again. Thread through the first of the 2 seed beads, pick up 2 more seed beads and thread through the second hole on the twin hole. Add a pink seed bead between each twin. Pick up 2 white seed beads after the last twin and thread through the 1st seed bead closest to the pink crystal to match the other side of the petal shape. Travel back around the petal shape and thread out of a pink seed bead. Pick up another pink seed and thread through the next seed bead so it sits on top of the twin hole bead. Do this 5 times. Travel back around the petal shape and exit through the 1st of the new pink seed beads you added in step 4. Pick up 2 twin hole beads and thread through the next seed bead. Do this 4 times. Finally, travel back around the petal, and add a single seed bead in the centre of each of the twin hole pairs. Weave your thread back into your beadwork, knotting along the way until you are confident it won't unravel. Do the same with your tail thread and trim off any excess cord.